It is still unclear what is true, but major media outlets have not jumped onto the story. This could be due to fear of an upcoming media takeover by government, the Sherrod Charade may have been a ploy to intimidate leftist opponents, or the story may be false. It is enough to say that the Tea Party Movement has been correct about the Administration and the socialist tactics of big government. The leftists need to have something to hold up to discredit new media, even if it is out of context or completely false. This is not about truth or right and wrong, it is about power, hate, control and freedom. 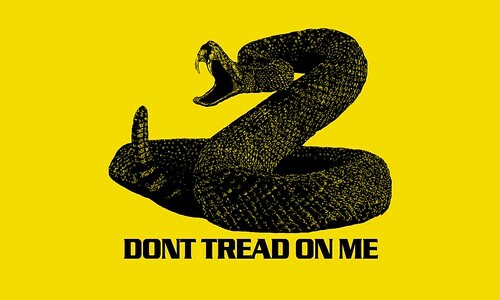 Remember DONT TREAD ON ME. We do not need to strike first, because truth is venom to tyrants. We can rattle before we strike. Be selfless, do not try to make a name for yourself, rush to judgment or take credit for a story because there are no Pulitzers in new media. To a larger point, remember that one honest, self-made, trustworthy person is an example to the entire world. For tyrants to oppress humanity, no one must be allowed to rise up into a position of honor and self-reliance. This oppression is an impossible task. We are imperfect, but the only weapon tyrants (Alinsky) have is to focus on imperfections. We can focus on truth, so lets do our research and be distinct about opinion and fact. Do not obey their rules. ASSOCIATED PRESS - Shirley Sherrod, who until Tuesday was USDA's director of rural development in Georgia, said she was on the road Monday when Agriculture Deputy Undersecretary Cheryl Cook called her and told her the White House wanted her to resign. "They called me twice," Sherrod said. "The last time, they asked me to pull over the side of the road and submit my resignation on my BlackBerry, and that's what I did." Agriculture Secretary Tom Vilsack issued a statement saying his agency has no tolerance for discrimination. The controversy began Monday when the conservative website BigGovernment.com posted a two-minute, 38-second video of Sherrod's remarks to a local NAACP banquet. She said the video was selectively edited and misleading, while the white farm family she was accused of discriminating against came forward on Tuesday to praise the help she gave them. The NAACP's leaked video fails to play the proper context of Mrs. Sherrod's statements. She continues on in the unleaked portion of the tape to use her story as reason that "race is not the issue," "I learned my lesson," and "the real issue is poverty." By leaking only the portion designed to inflame conservative commentators and bloggers, Media Matters, the NAACP and the White House have created a political trap in which they hope to influence voters and news coverage throughout the election. Once Glenn Beck, Bill O'Reilly and others pounced on the story, the remaining tape was to be released. In the next daily news cycle, the remaining video was released, but unfortunately for President Obama, Glenn Beck did not fall for the ploy. This ploy to discredit conservatives is ammunition to label bloggers "witch hunters" and build a case against new media in general and http://www.biggovernment.com/ and Glenn Beck specifically. On The O'Reilly Factor, Alan Colmes immediately spouted what seemed to be the Media Matters talking points before Bill O'Reilly had even seen the remaining video. Politics of this sort is designed to deceive and if you have read my report on The Logical Goals of Good and Evil, you will understand that this tactic is nearly as Evil as the apparent White House plan to assassinate American Citizens. California has the highest gasoline (and diesel) tax in the nation. Recently, the tax scheme was changed to include a flat 17 cents/gallon plus 2.25 percent excise tax to ensure revenue in an economic environment of sliding gas prices. The gasoline sales tax had been 8.25 percent, but legislators fear the recession will continue to reduce the quantity and price of fuel consumption. As of April, total gasoline taxes in CA averaged 67.0 cents/gallon, 3.5 cents above second place Hawaii. http://www.api.org/statistics/fueltaxes/ That's more than TRIPLE the PROFIT per gallon of the oil companies. Another effect of the tax hike is to prepare Californians for AB32 and Federal Cap and Trade policies which will "neccesarily make energy prices skyrocket" in the worlds of power-hungry President Obama.